Demo is the SSIS Catalog folder. 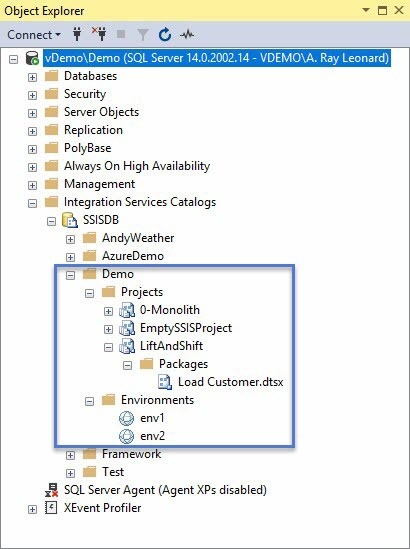 Demo contains three SSIS projects named 0-Monolith, EmptySSISProject, and LiftAndShift. 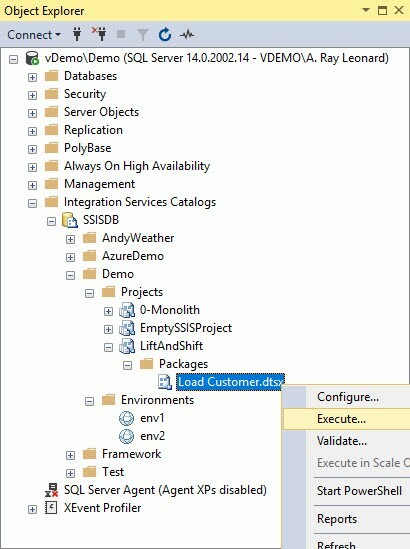 If we expand the LiftAndShift SSIS project we see it contains a single SSIS package named Load Customer.dtsx. The Demo folder contains two Catalog environments named env1 and env2. These are the artifacts surfaced via the Integration Services Catalogs node in SSMS. 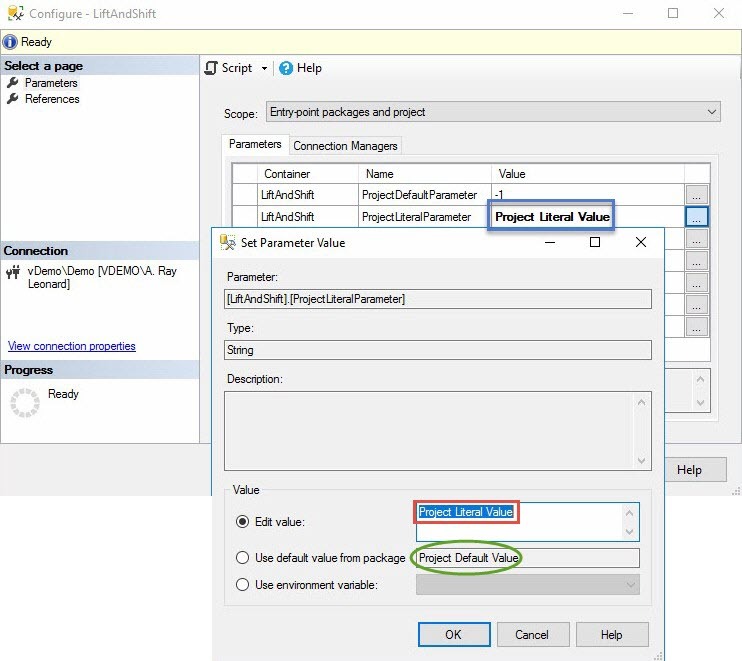 Design-time defaults are the default values entered by the SSIS developer when building the SSIS project. These values remain with the SSIS project as it is deployed. 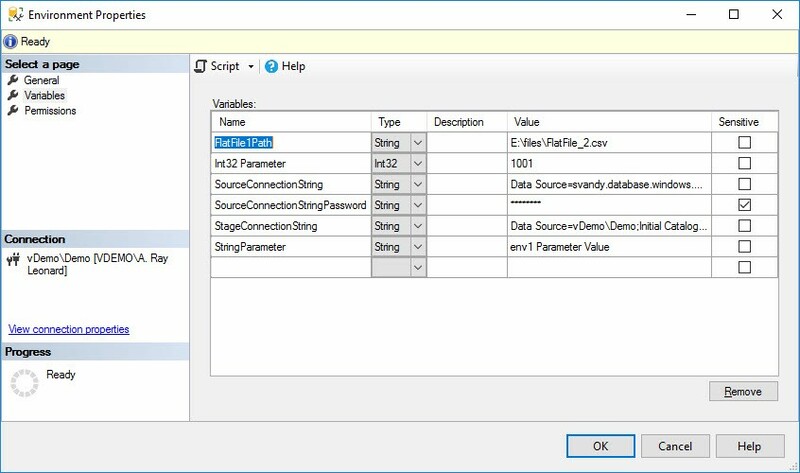 They are not changed unless and until another version of the SSIS project is deployed, one which contains different default values for parameters. Design-time defaults are denoted by no text decoration. Configuration literals are stored in the SSIS Catalog. 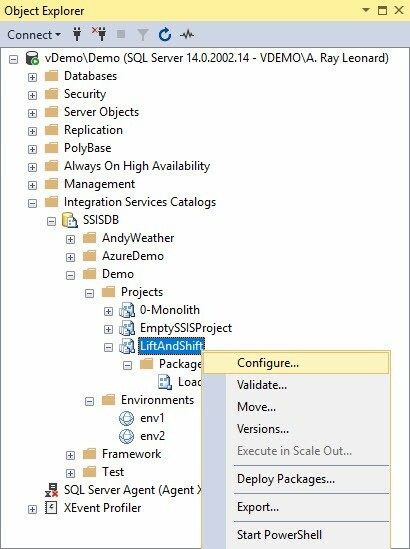 The values are “hard-coded” to override design-time defaults when the SSIS package is executed. Configuration literals are denoted by bold text decoration. The design-time default value for ProjectLiteralParameter is “Project Default Value” shown circled in green above. 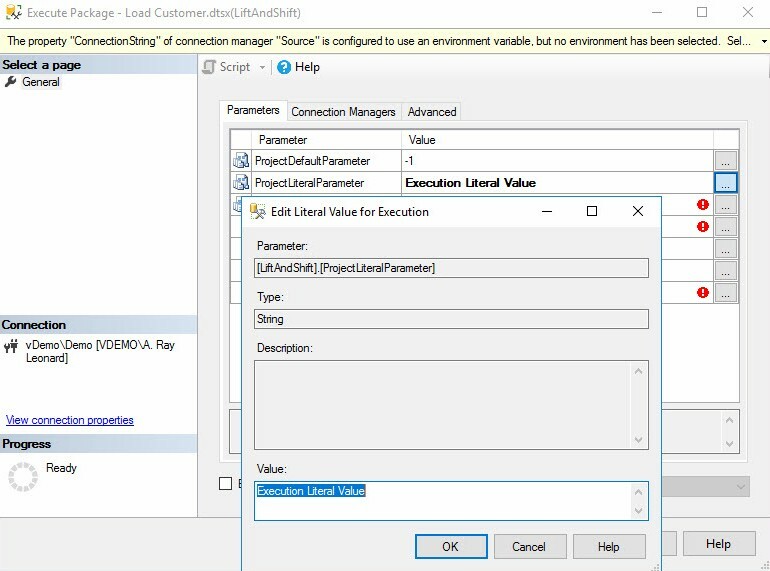 The Configuration Literal value is “Project Literal Value” and is shown inside red and blue boxes in both the Set Parameter Value dialog and the Configure project window. Why are the Configuration literals not identified as such in the Execute Package window? The reason is that these values can be overridden as Execution literals. This is a little complex so please bear with me as we examine what just happened. Please note: Execution literal values are not persisted in the SSIS Catalog. They are applied for the current execution – the execution triggered when the user clicks the OK button on the Execute Package window – and that execution only. If the use clicks the Cancel button and then re-opens the Execute Package window, all values revert to their Configured state. 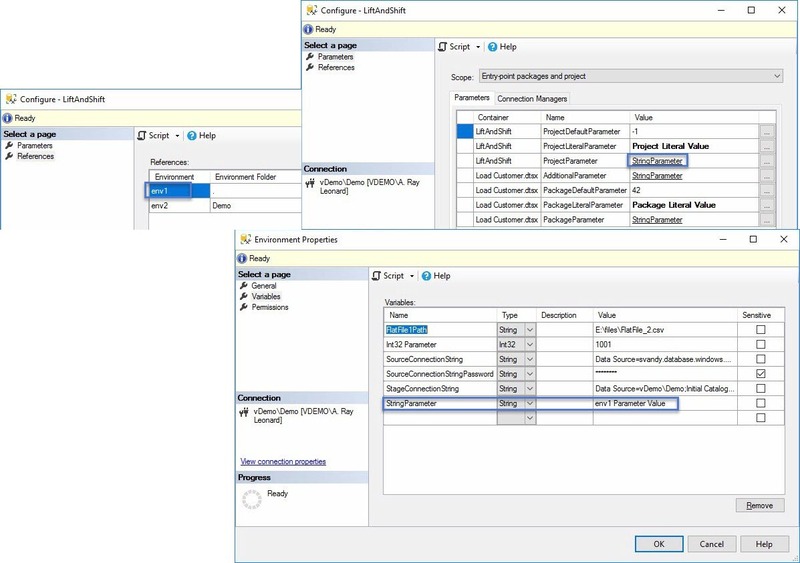 Reference mappings are a mechanism for externalizing configurations in the SSIS Catalog. References are an elegant solution for configurations and release management. As with all flexible solutions, they are complex. 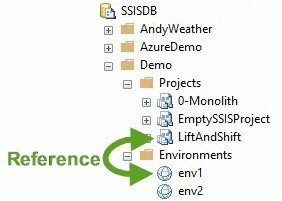 Reference mappings begin with References, and references begin with SSIS Catalog Environments (did I mention this was complex?). 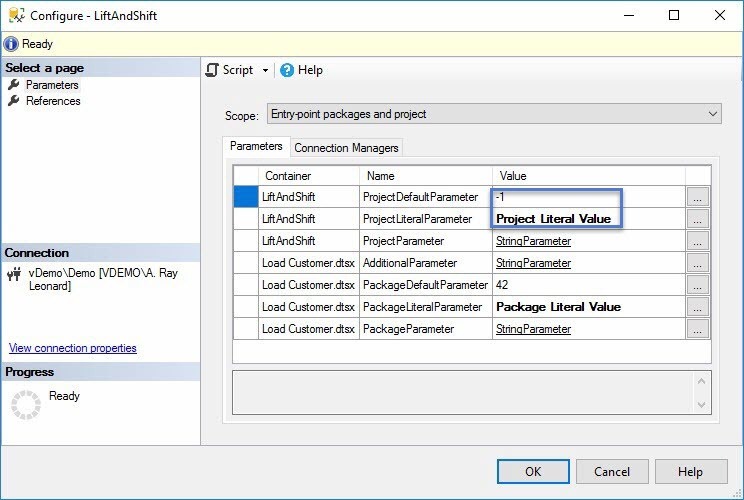 A reference mapping applies (“maps”) the value of an SSIS Catalog Environment Variable – accessed via a reference – to an SSIS Project (or SSIS package) parameter. In the image above, StringParameter is the name of the SSIS Catalog Environment Variable mapped to the parameter named ProjectParameter. 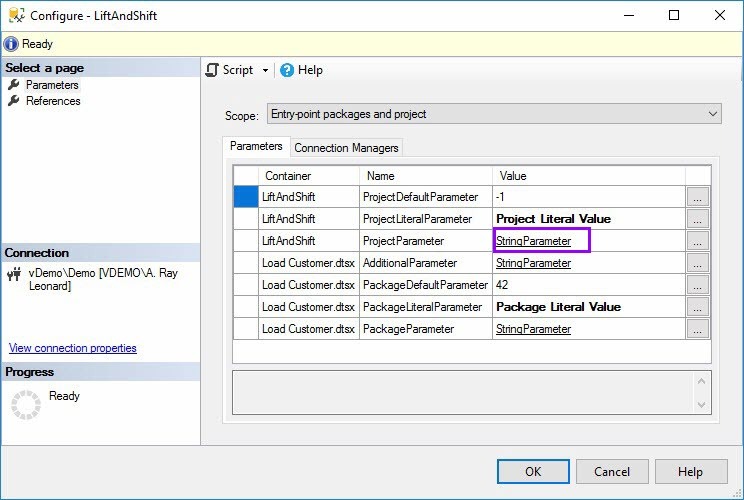 This means the value contained in the SSIS Catalog Environment Variable named StringParameter will be used to override the value of the parameter named ProjectParameter at execution time. 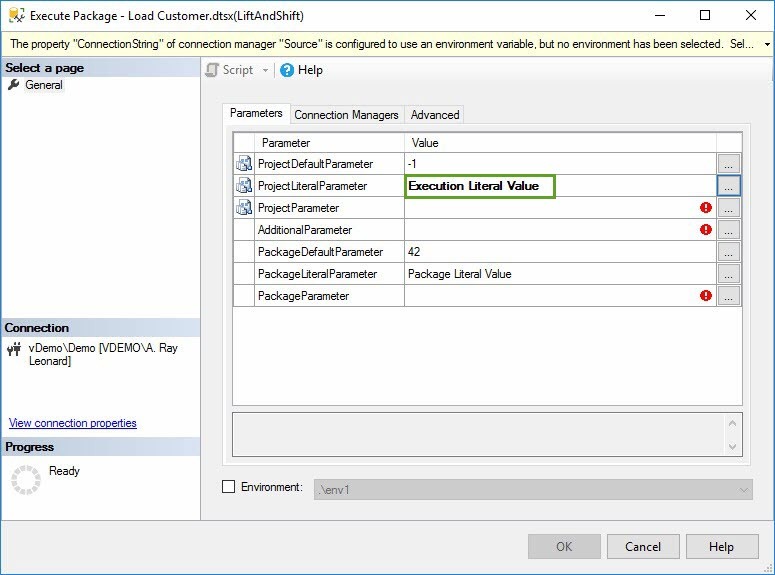 SSIS Catalog Environment Variable value property overrides the parameter value at execution time. Not discussed: Multiple references and reference selection at execution time. You can find the value that will be used at execution-time using SSMS. It’s… complicated. And it’s even more complex if we include multiple references to different SSIS Catalog Environments. This last image is why I wrote SSIS Catalog Browser. 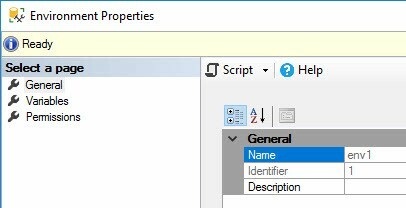 Catalog Browser is free and I write about how to see these same SSIS Catalog artifacts in the companion post titled Viewing SSIS Configurations Metadata in SSIS Catalog Browser.